A book that explores power, politics and the sparks of conflict in the Northern Territory’s sometimes-fractious relationship with Canberra will be launched in Darwin next week. “Speak for yourself” by former Chief Minister Clare Martin and historian Mickey Dewar captures the thoughts of the first eight chief ministers reflecting on their time in office. Ms Martin, a Professorial Fellow with Charles Darwin University’s The Northern Institute, said each Chief Minister had a unique approach to tackling the job and the challenges that went with it. 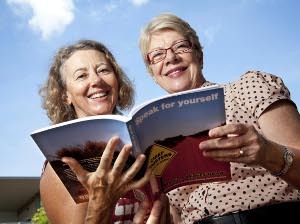 “Each chapter represents a story from a key player in the history of the Northern Territory who tells of their political life and times, and the federal moves that challenged the Territory’s independence and authority,” Ms Martin said. Ms Martin said that with the benefit of hindsight, it was a shame that the Territory missed the offer of statehood, made by Malcolm Fraser in 1975. “We could have been celebrating more than 30 years as the seventh state of the Australian Federation, and this would have been a book about eight premiers. Ms Martin said it could never be assumed that legislation passed in the Territory Assembly would stay passed while the NT remained under the legislative control of the Federal Parliament. “It happened with euthanasia, the nuclear waste dump and the Emergency Response. Ms Martin said the book also celebrated some of the Territory’s finer moments, including the establishment of Charles Darwin University, the opening of the Alice to Darwin Railway and the development of relationships with Indonesia and other Southeast Asian neighbours.